Centrally located in the building, the Art Reference Library houses hundreds of visual arts books and journals available for research and study. The Museum regularly subscribes to 15 periodicals as well as the Art Index. The library is open to the public during regular business hours; its holding are non-circulating. A recent special learning project in partnership with Springfield Museum of Art and Yellow Springs Schools brought 22 high school students to the museum to research works of art from the Museum’s permanent collection. 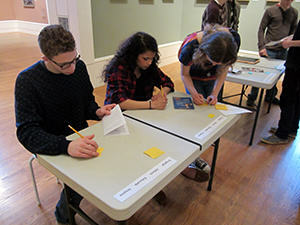 Students worked with Museum Educator, Deb Housh, to write and design gallery guides.